Barbarians is a web browser based free to play base defending MMO where thousands of players battle it out against one another to build the best town they can, defend it and raise their own army of warriors to destroy their rivals. Focusing on solo play initially players will get the chance to work together, orchestrating joint attacks on targets, and climbing up the rankings to achieve prizes for their success. The main gameplay of Barbarian revolves around gathering up resources from various sources, namely Gold and Wood, these can be acquired by completing Quests that task you with training troops, constructing specific buildings, or taking certain actions in a way to guide players into the game. Alternatively specific resource production buildings can be constructed to provide both Wood and Gold, the higher the level these buildings are upgraded to the more resource output players will receive. Finally, players can gain a big lump of resources when they attack rival towns, raiding and destroying these locations will yield both resources and Fame. Resources are spent to build new structures in your town, upgrade them, create defenses such as walls, catapults and crossbows and even train up your own army of barbarian soldiers. With a newly assembled army players can challenge other players’ defenses by raiding them, early in the game players are randomly matched to a player around the same level, this generally means that players will have a balanced offensive force to match a similarly levelled defensive force. Each town has a Keep and the level of this keep determines the max level of all other buildings, from here players can only have as many units in their army based off the level of their camp, so players aren’t able to simply create hundreds of units to attack low level towns. Combat is relatively simple and consists of loading up at the target players’ town with access to all the soldiers currently in your own camp; players have ten seconds to assess the defenses and choose the best place to begin their attack. 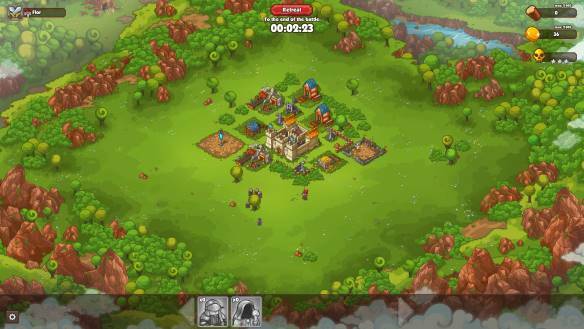 When the timer ends players only have a few minutes to attack the town, this is done by clicking around the perimeter of the town (players can’t drop troops in the middle of the town) to individually place units from which the units will follow their own prioritized actions and attack the various buildings or defenses. Players have no control over their units once they are placed and the battle becomes automated and ends with the destruction of all the buildings, the attacking force or if the timer runs out. To help run their town players can buy Cards with Stones earned from PVP or Crystals as a premium currency (also acquired by completing challenges); these cards can be equipped to the town to give it various boosts and bonuses such as improving production, defenses or unit attack ability. The level of the player and their acquired fame determines how many cards a player can have active at any one time.